This is the Marketing for Owners Podcast and I enjoy myself giving you little tidbits of information about marketing, about business tips, stuff that I have learned in running my businesses is for over thirty years. What? Thirty years. Well you would think I would know a few things. And all I give you is the stuff that works, stuff that helps. 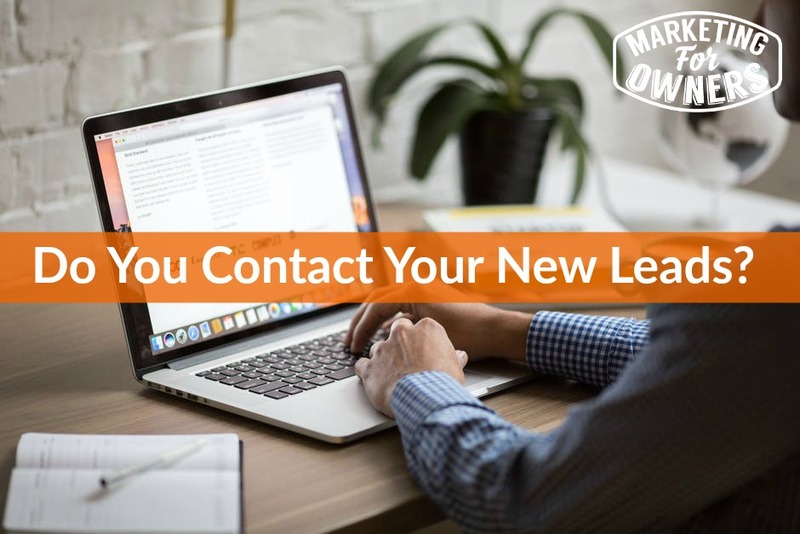 So today we are talking about leads and what you do with them and following up and stuff like that because it is one of my pet peeves, it just kills me. And in actual fact, next week or at some point I have got to go to the fire exhibition because I have fire safety businesses in the UK, I’ll be back in England of course. And I can guarantee I’m going to spend all day there, I am going to talk to people, the ones I am interested in and I’m going to spend time and of everyone I talk to and I ask them to get in touch when they are back and things have calmed down, I guarantee only half of them at best will get in touch. They are probably thinking, “Well he has got all our stuff, if he wants to hear from us he will get in touch with us.” But no, and it annoys me because I won’t get in touch with them because I think if they can’t be bothered to put the effort in, what is their service going to be like? Why should I bother? I shouldn’t have to make an effort to be sold to even when I want to be sold to. Does that make me stubborn? Is that pride? I don’t care, it has got me this far. So what will happen is, in actual fact, there’s loads of figures in this. Because leads make you nothing and everyone, everyone is a lead who has been in touch with you up until the point they tell you they don’t want anything. That does involve you by the way, having to ask them if they want to buy something; which is the call to action, we will discuss that some other time. But of the figures, fifteen percent of people who get a lead will never ever, ever, ever follow up, won’t do anything; fifteen percent. I am going to guess it is higher than that in reality because they probably only measure companies that are big enough to respond. Most others will respond once and that is probably after a week and the majority of those responses are, “Hey thanks for your inquiry…” etcetera, it is not a real follow up, that is just the initial contact. Then you have got a sub section that will respond maybe two, maybe three times max and then they give up, then there is nothing else. And what this means is you have got no process, you have not thought about it and it is not your fault. Let us get this straight, you are not a sales person, I understand because if you are a sales person or a marketing person you would be doing this. You are an engineer, you are a gardener, you are a dentist, you are a qualified professional, you are an accountant, a solicitor, a lawyer, you are a builder, a framer, a business coach; you are not a sales person. So that is one of my jobs, this is what I am trying to do. I started off as a door to door salesman and I know a few things but I’m not some qualified sales rep, but I can tell you how to get a sale and how to get an order. It certainly is not waiting for people if they are that interested, to pick up the phone and call you or to get in touch when they want something. No, that won’t do you well. What you have to do is you have to keep in touch with them because they have to get to know you, they have to start to like you and then they need to trust you before they are going to buy anything. You need to contact them six, seven, eight, nine, ten times and it may be more, never stop. So this is what I am going to suggest today is, because by the way, the easiest way is by email, but of course there is the phone. It depends on what information you have collected. If this is an email lead, say it’s off your AWeber or your Mail Chimp list, you have only got their email probably and their name. Bbut if you have been at an exhibition, hopefully you have got a phone number, a business card an address, so you have got lots of different options. And if you start to follow up and talk to people, you can ask for that extra information later, build it up. Have you ever heard of a CRM, something like Insightly or Big End, Salesforce, things like that. Look up CRM, customer relations management tools, there’s loads of free ones, SugarCRM, there are millions of them. Look them up, get one then enter all the information in there. That is what they are designed to, that’s why the sales companies use them. Imagine how easy your life could be if you would only try these things. So what I suggest is that you actually figure out ten ways you’re going to contact everyone who gets in touch and you just create a process and a system so that any of your staff can apply it. So open up a little Excel spreadsheet or a Google sheet or something like that or a Word doc or whatever and you say, number one and write down something like, and you can contact them with an email or a message. Say something like, “Thank you for contacting us. Before we give you [someone has made an inquiry okay] so thank you for contacting us. Before we give that, why not to go to our blog? And be informal, talk like you are talking to a friend, talk like I am talking to you because that’s how we are in real life. You might be lawyer, but don’t talk them like you’re some kind of lawyer in some kind of legal contract; this is someone you want to talk to like a friend. And the next bit of contact, something like, “Hey, here is the download that you asked for”; or whether they asked for one or not, how about giving them one? How about making it? Here is the download for our check list or our infographic or our report or something, “I thought you would like to see it. A lot of our customers have used this as a basis for…” etcetera. I’m not going to give you the whole message, you’ve got to do some work, come on. Don’t be so lazy; you know what I mean. Now for most people being told someone will follow them back is great, but it is not about that these are people who are potential clients they are interested, you are inviting them to be social and they are going to be social, so go be social with them; all this kind of stuff. Now how about after this, don’t forget to ask or tell people what you want them to do, tell them, call to action, all that kind of stuff. Add a business card or something, hand write the envelope, put a real stamp on it; that will get opened. You always open those because you think they are from a real person. Well this is a real person. I mean obviously ask in a very nice way. “We want to provide it and we would love to know.” This is a killer, people love being asked for their opinion and for help and feeling superior, they love it. Don’t be scared. And how about sending them a short survey, what are your top three requirements for the next three months? Give them multiple choice answer, all this kind of stuff. Get in touch, keep in touch, follow up, follow up, follow up. I think you got the gist. It is Monday and that means it is time for book for the week. 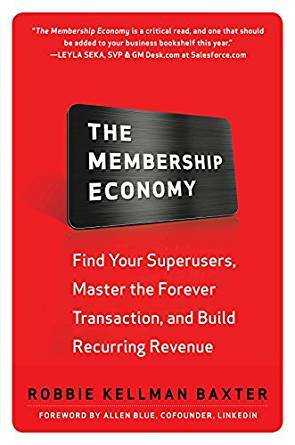 For this week we are recommending The Membership Economy, it is by Robbie Kellman Baxter. 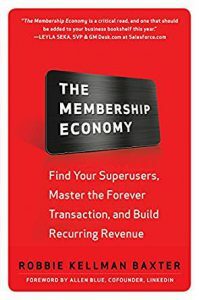 Anyway, The Membership Economy just Google The Membership Economy book, you will find it at your local retailer. It pretty much does what it says on the back cover read it, go for it.